The Netgear N450 Wi-Fi cable modem router unleashes download speeds of 340Mbps. As typical for this brand, this modem works with most cable internet services and has 4 gigabit Ethernet ports and 2 USB 2.0 ports, making this ideal for hooking up many devices. 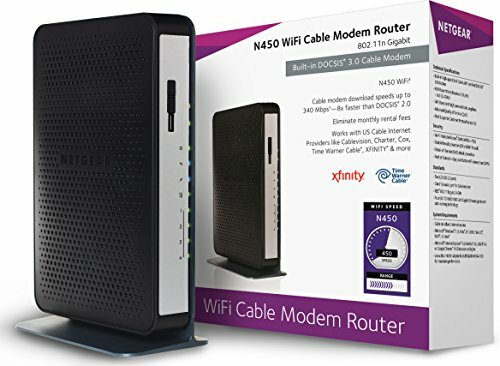 Providing Wi-Fi up to 450Mbps at 2.4 GHz, this modem doesn’t have the best Wi-Fi connection and will most likely need the programmed software, or firmware, to be updated. Be sure to check with your internet service provider before purchasing and compare prices with the Netgear C3000.